Adjust oven rack to lowest position; heat to 425 degrees. Cut onions in half; toss with melted oil and a generous sprinkle of salt and pepper. Place, cut-side down, on a lipped cookie sheet. Roast until tender and cut surfaces are golden brown, 25 to 30 minutes. 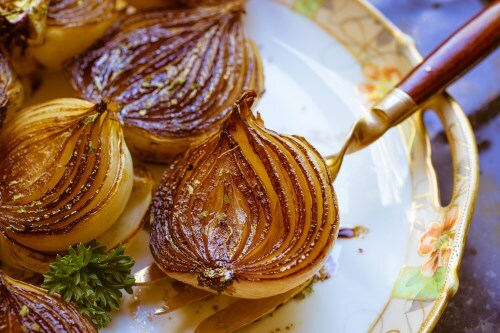 Adjust seasonings; drizzle with balsamic vinegar.